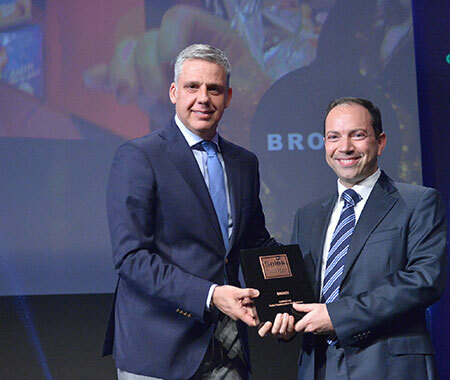 ELBISCO received the bronze prize for developing i.Anywhere, a mobile app for automated sales, during a special ceremony held at the Athens Concert Hall for the 2017 Sales Excellence Awards. The company was awarded in the Digital Transformation of Sales category for the Innovative Anywhere application. The app was developed in cooperation with DIS and was launched in March 2016. It aims to streamline the company at both a vendor and an inspector level, so that all operations are executed electronically and maximum efficiency in their respective roles is ensured. The functions performed by the app include inventory and order taking, two-way communication with the sales team, continuous monitoring of product prices for both the company and the competition, implementation of merchandising actions, assessment of the salesmen’s activity by inspectors, and more. The i.Anywhere application was awarded for the second time, as it had won the silver prize at the 2016 Mobile Excellence Awards.